The Design Museum opens its new doors in Kensington on 24 November. We went for a sneak peek to find out whether it's worth a visit. The museum is in the old Commonwealth Institute, a rather dull looking blocky building from the outside, and not at all what one would expect from a museum which has design at its forefront. 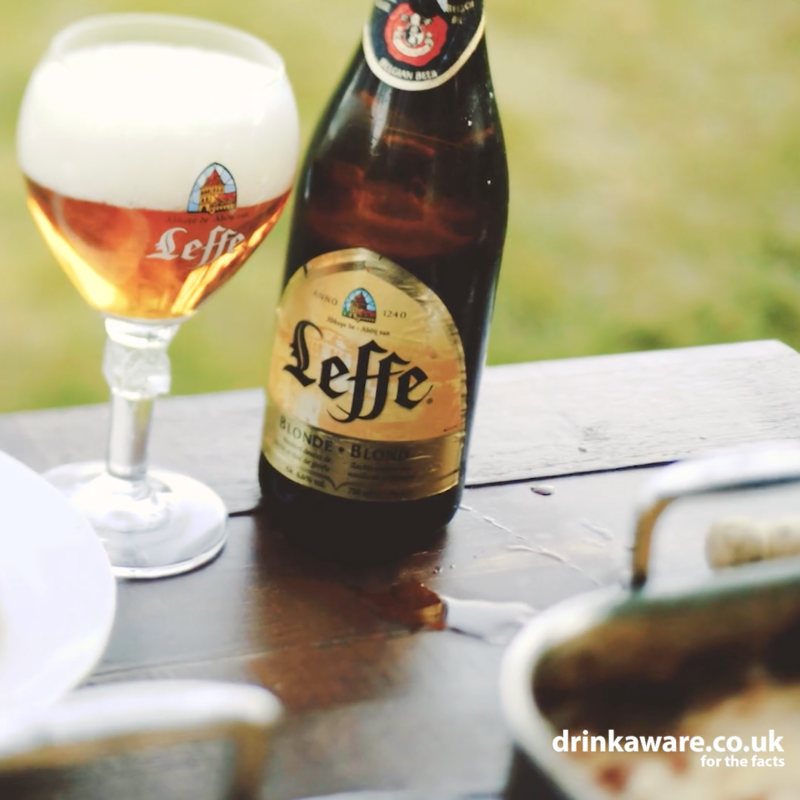 with a pit oven and pair perfectly with Leffe Blonde, the Belgian beer. 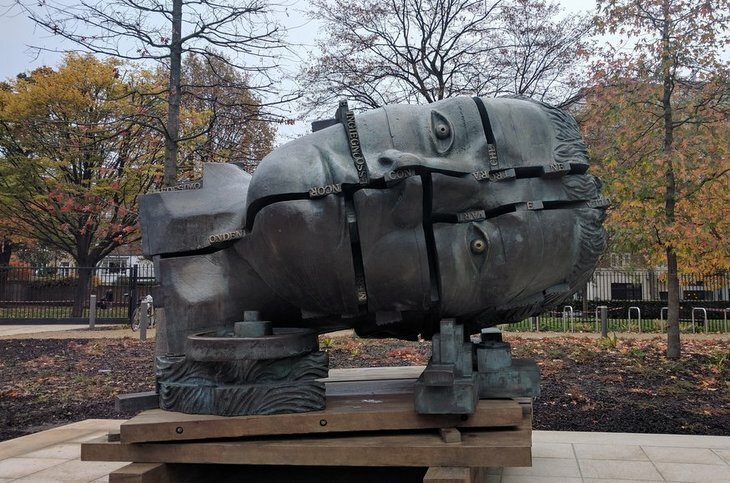 This Paolozzi head can be found outside the museum. But step inside to witness an impressive transformation. 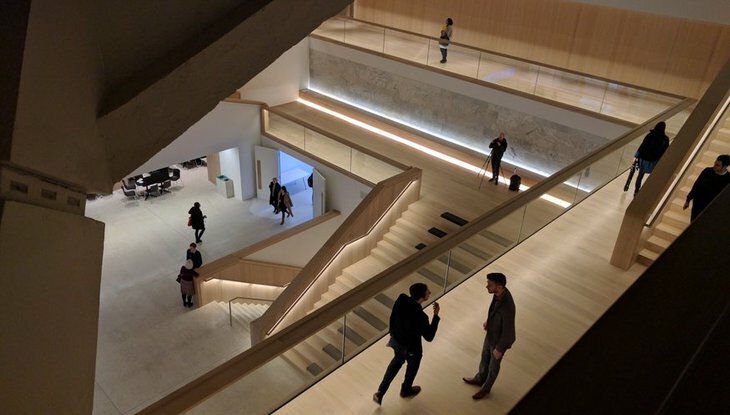 An £83m investment means the new Design Museum is architecturally beautiful, and over three times bigger than the old museum was in Shad Thames. The central atrium is vast and stunning. All aspects of it combine beautifully with wooden flooring and LEDs under the handrails and bannisters and from behind the benches giving the whole atrium a warm glow. Plus the ceiling is a hyperbolic paraboloid — and we do love a good hyperbolic paraboloid. The spectacular atrium is a joy to behold. If you want to sit down and take it all in, there are leather benches on the stairs where visitors can relax and gaze up in wonder. One major improvement over the old Design Museum is that entrance to the museum and the permanent collection is free. The permanent collection is housed on the top floor and includes a wide variety of exhibits, including the new design for future Underground trains and British road signs. It contains over 1,000 objects — though it wasn't all up and running when we visited so we can't comment on the merits of the whole collection. The crowd sourced wall of 'good designs', with the Underground roundel taking centre stage. We're particularly enamoured with a wall where people have been asked what constitutes good design. 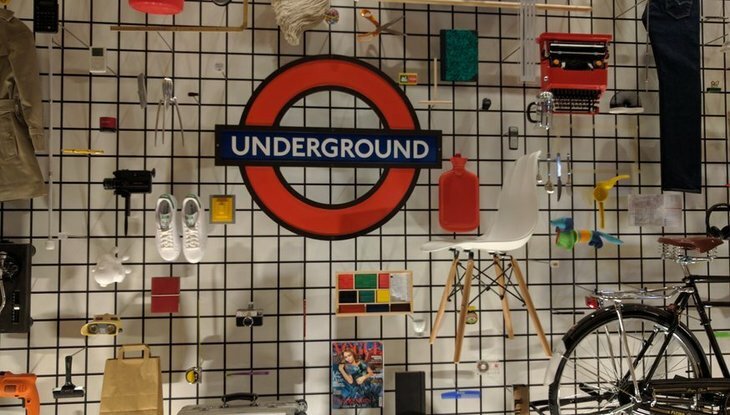 The crowdsourced answer is displayed on a wall with everything from the Underground roundel to a pair of flip flops featuring. The museum doesn't shy away from the difficult questions either, asking whether the AK-47 is an example of good design. It is very effective at what it does, even if the output is devastating. It also questions whether the designer is responsible for what an object is used for. There are two exhibition spaces for ticketed temporary exhibitions in the museum. 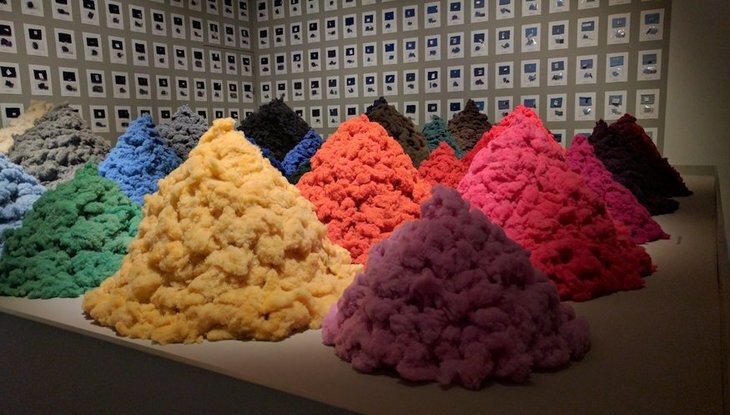 The ground floor currently houses an exhibition called Fear and Love, featuring eleven installations including mountains of coloured fabric, an industrial robot arm that likes to explore and follow people around, and a selection of 3D printed death masks. Mountains of coloured fabric reflect on the difficulty of sorting fabric by colour, which makes it difficult to recycle. One of the most insightful is a display relating to dating apps. It tackles the rise in dating apps and looks at how the gay dating app Grindr has been used by Governments to persecute homosexuals, but also how refugees have used it to find support networks when travelling across Europe. The Designs of the Year exhibition is in the basement, in an area that can be tricky to locate as the stairs are hidden behind a wall. The designs on show are quite disappointing this year and nothing in particular stood out for us. We'll end with another spectacular shot of that atrium. Most people will visit at first to see the new building. It's spectacular (and free) but be warned that opening weekend is likely to be very busy. 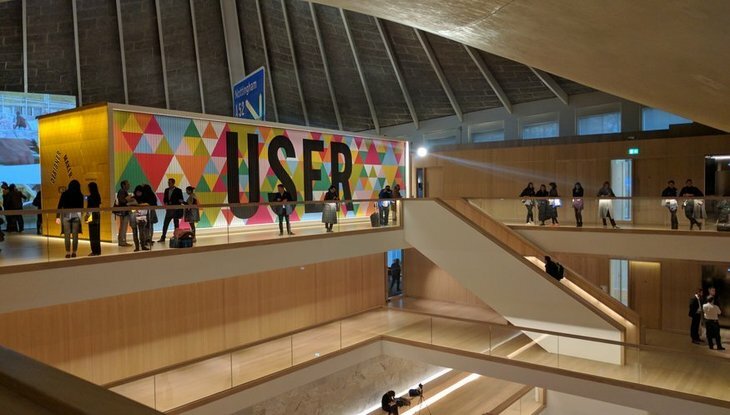 This is a great start for the new Design Museum and we look forward to re-visiting when it's open and to seeing more exhibitions here in the future. 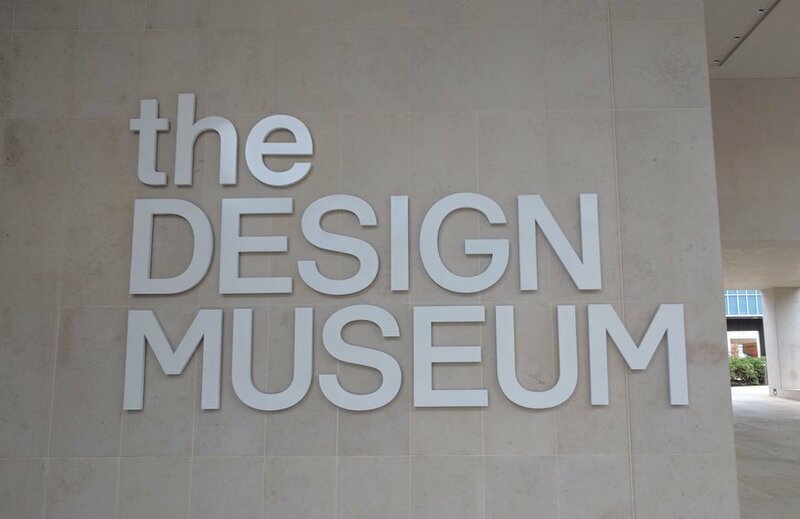 The Design Museum opens on 24 November at 224-238 Kensington High Street, W8 6AG. Entrance to the museum is free. The exhibition Fear and Love: Reactions to a Complex World is on until 23 April, tickets are £14 for adults. Beazley Designs of the Year is on until 19 February, tickets are £10 for adults. We went for a wander around the museum and streamed live from there.